An “impressive” tale of psychic power, Native American mysticism, and an ancient evil in Alabama, from the New York Times–bestselling author of Swan Song (Associated Press). Born and raised in rural Alabama, Billy Creekmore was destined to be a psychic. His mother, a Choctaw Indian schooled in her tribe’s ancient mysticism, understands the permeable barrier between life and death—and can cross it. She taught the power to Billy and now he helps the dead rest in peace. Wayne Falconer, son of one of the most fervent tent evangelists in the South, travels the country serving his father’s healing ministry. Using his unique powers to cure the flock, Little Wayne is on his way to becoming one of the popular and successful miracle workers in the country. He helps the living survive. Billy and Wayne share more than a gift. They share a dream—and a common enemy. They are on separate journeys, mystery walks that will lead them toward a crossroad where the evil of their dreams has taken shape. One of them will reject the dark. The other will be consumed by it. But neither imagined just how monstrous and far-reaching the dark was, or that mankind’s fate would rest in their hands during an epic showdown of good versus evil. From the author of Gone South, Boy’s Life, and the Matthew Corbett series, a master of suspense who has won the World Fantasy and Bram Stoker Awards, Mystery Walk offers “creepy, subtle touches throughout [and] splendid Southern-town atmosphere” (Kirkus Reviews). I have yet to be disappointed by McCammon, and this book is another great read. The characters are all so well developed and the story has so many twists right up to the end that I almost found it hard to catch my breath. Perhaps being a bit dramatic, but the book is really good. Every time I read a McCammon book, I am amazed at the variety of characters and stories he writes about. Every time I finish one of his books, I always think, "This is his best book he's ever written". Every time. This is a paranormal thriller and it is definitely a page turner. The main protagonist, Billy, possesses psychic powers that he inherited from his Indian mother and that scare and repulse his white father as well as all inhabitants of small Alabama town. The plot follows Billy through his childhood in Alabama where he is shun by others, his work at carnival and, finally, his encounter with an evil man, Krespin. Billy’s life is commingled with the life of other boy, a healer. The story is about good versus evil but there is definitely more evil than good in it. The cruelty and narrow-mindedness of ordinary Alabama folks are mind bogging and more scary than other parts of plot (and hopefully not true). The other evil parts come from expected (paranormal) sources and therefore are not so shocking but do yourself a favor and skip the beginning of the chapter when Krispin is watching a movie - I wish I did. The good is represented mostly by Billy. The reason for four stars and not five is that book reads like three separate books that differ greatly in general atmosphere and bring echos of other books that I read. And because of Krispin’s movie that, in my opinion, does not belong in a book of this format. Billy Creedmore lives in a small rural Southern town with his parents. He is shunned by the other children and his family is shunned by the town. His mother is called a witch for her ability to help the dead. Townspeople call on her when she is needed but stay far away from her otherwise. When the family of Billy's best friend is murdered, he feels a strange calling to enter their house. Their spirits are shocked and can't cross over. There Billy discovers his life calling. He also has the ability to help those who can't cross over do so. Wayne Falconer leads a very different life. His family is wealthy where Billy's is dirt poor. He is the son of a famous evangelist and spends his summers traveling with the crusade. One night his father discovers Wayne's talent; he can heal the sick. Or at least it seems that way. Wayne becomes famous as the sick and dying flock to him to be healed. Everyone believes in him, except for Ramona Creedmore and her son. When they come to the crusade, they see through Wayne and see that he can heal no one. Thus begins a rivalry between the two boys that continues as they grow up. Each has a talent. Each is learning how to use and shape it and wondering how their lives should revolve around it. Each fears the other and the Shape Changer, a beast that comes to them in dreams and tells them how it will kill them and eat their souls. When they are grown, they meet again and must discover family secrets and what is the truth about their powers. They must unite to fight the Shape Changer and hopefully defeat him once and for all. 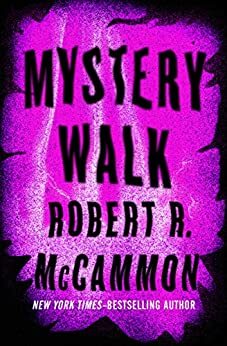 Robert McCammon has a talent for writing books that are compelling and keep the reader turning the pages to discover what happens next. This book is considered a mystery/horror classic and readers will be interested to see which boy can rise to defeat the forces aligned against them both. It is recommended for mystery and horror readers. I don't know how Robert McCammon does it. How can one writer give us a beautiful, nostalgic book like "Boy's Life" and strike literary gold again with a supernatural thriller the quality of "Mystery Walk"? "Mystery Walk" deals with young Billy Creekmore, and his struggle to deal with his unusual gift...the ability to help the souls of the restless dead find their way out of this earthly plane. McCammon has written a suspenseful novel, just this side of a full-out ghost story. This genuinely scary, often touching novel follows Billy as he discovers his calling and ventures out into the world trying to do what his soul tells him he must. With a wonderful supporting cast of characters, McCammon has delivered a page turner filled with rich imagery, human struggle and an unforgettable battle between good and evil. "Mystery Walk", like McCammon's "Swan Song" proves that this author easily crosses genres with amazing skill and thoroughly engaging storytelling. Highly recommended! The story itself is very good - perhaps not one of McCammon's best, but even a middling McCammon book is well worth reading. Unfortunately, the Kindle edition was scanned in and not proofread. The text is riddled with OCR errors that seriously detracted from my enjoyment of the story. Things like 'bead' for 'head', 'bouse' for 'house', 'Mend' for 'friend', etc. The publisher really ought to be ashamed to be selling this as it is. I do recommend reading the book, but skip the Kindle version.